In this write-up, I want to share my favorite microphones I currently use. I do keep this page updated with my current favorites, just to let you know! One thing I’d like to say before getting into the microphones..
Learning about microphones is a totally different aspect of music production than just making beats. When just making beats, a lot of our sounds are digital. This means they are very pure and extremely high quality. But when we get into recording, there’s big chances for our recordings to fail for multiple reasons. These are not elements we ever have to face with a digital synthesizer! So once you record your vocals, your next step is learning how to mix your music to achieve the best result from your recordings. The Shure SM7B dynamic microphone is a bit pricey for a starter microphone, but in my opinion, this has been my most favorite microphone in regards to suiting my voice. I find when I rap, a lot of my words are very sibilant with most condenser microphones I’ve tried. This makes for a harder processing job come mix time, whether that be having to dial back some high-end on my vocal, or use a de-esser to tame the sibilant words! But this is a dynamic microphone, and one that so far, I have loved for rapping. 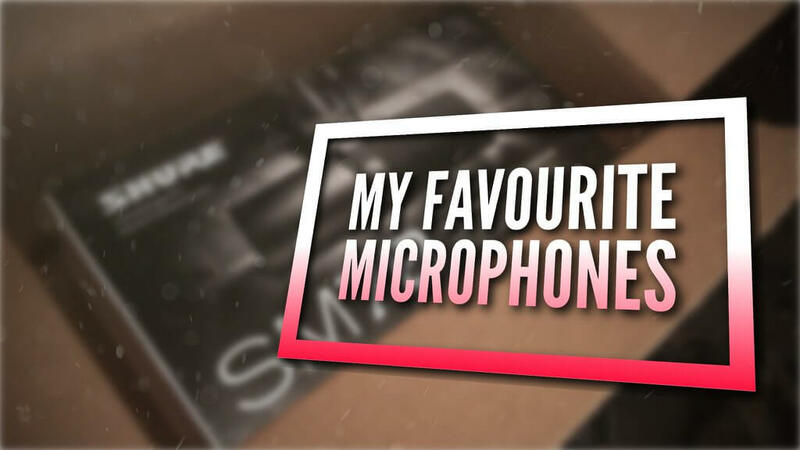 In addition to myself loving this microphone, it’s one of the most popular tutorial microphones you’ll see on YouTube. There’s also tons of talk about legendary artists using the Shure SM7B to record albums such as Michael Jackson! 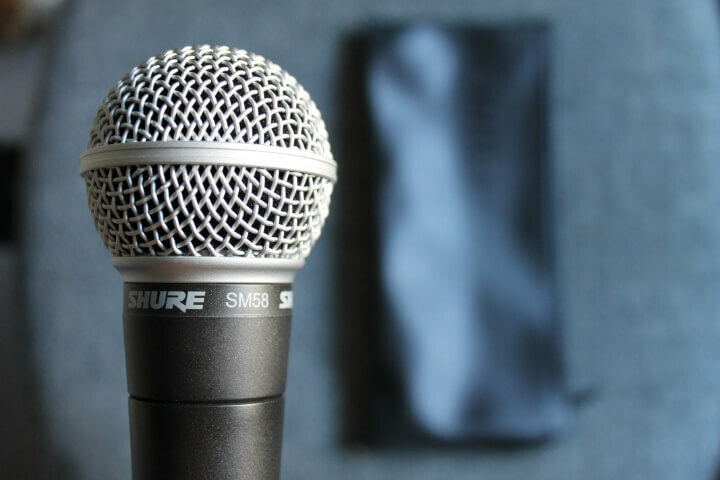 There has been updates to the mic over the years, as well as more accessories added to the package such as a bonus wind screen to prevent plosives! 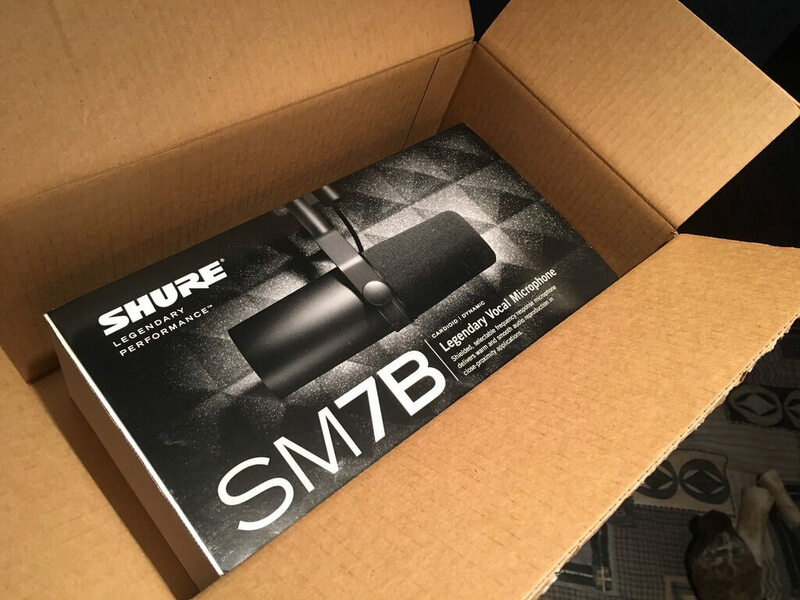 I’m glad I took the jump and purchased the Shure SM7B Dynamic microphone. 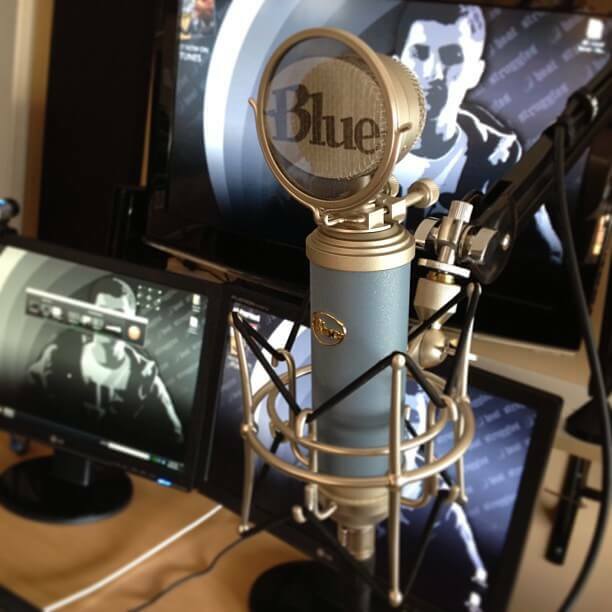 Blue’s Bluebird Condenser Microphone captures the high end great! It is a condenser microphone which is very sensitive to the environment around you, so if you’re in a louder type of environment, it’s going to be hard to get that clean recording you want. In addition, they also provide a super cool metal pop filter to prevent plosives. In my experience, I had better results with a third-party pop filter in regards to protecting my recording from distorting and removing the loud-end breathes. Overall, this microphone has done me pretty good, and I do like the overall sound. I do find when rapping into this microphone, my sibilant words are a bit exaggerated, again, making for more processing come mix time. I’m happy with the Blue Bluebird microphone, though. This Shure SM58 was actually my very first microphone I’ve ever purchased. The reviews are always so good about it that I thought it would be a good microphone. That was back in 2011, and yes, I still own it! Shure has actually had a lot of classic microphones used on countless records. This Shure SM58 Dynamic Microphone is incredibly affordable, and is pretty much indestructible! Since it’s a dynamic microphone, you do have to drive it a bit harder with volume, and the sound isn’t super bright. But for myself, as mentioned, I find my sibilant words are exaggerated when using condenser microphones.. So having a duller sounding microphone actually works better for me! It’s affordable, the reviews are absolutely amazing, and it’s a classic! That’s the Shure SM58 Dynamic Microphone for you – It’s a handy mic to have around! This was my second microphone, which is a condenser! The Audio Technica 2035 is a perfect microphone for getting your feet wet in the industry. Since it’s a condenser, it captures your high-end with much more detail than a dynamic, however in the lower price range condensers can sound a bit harsh in the high-end. The Audio Technica 2035 doesn’t sound too harsh in the high-end in my opinion, and when using it to capture instruments such as a piano, I always liked the result. I’ve even used this microphone in my music course called Organic Beats! 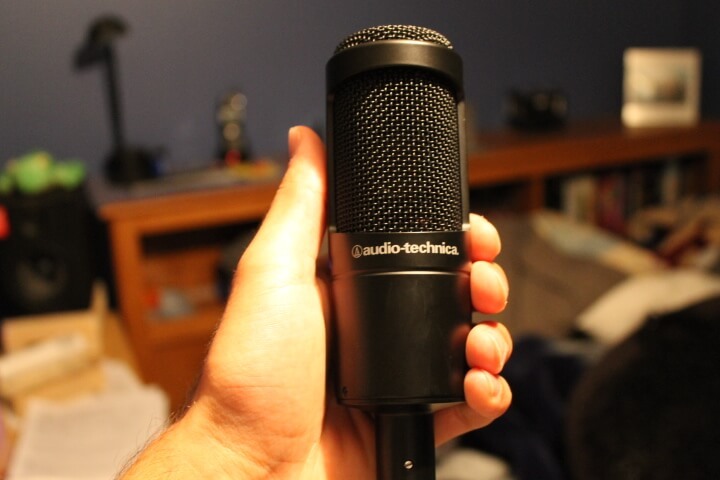 As mentioned, the Audio Technica 2035 is an awesome microphone to get started. So those are my current microphones I have, and I’m pretty happy with all of them! They all give a different sound, and for me personally, I really like the Shure SM7B with my voice. If you do not yet have an audio interface or microphone, you should check out the audio interface bundle deals companies offer. 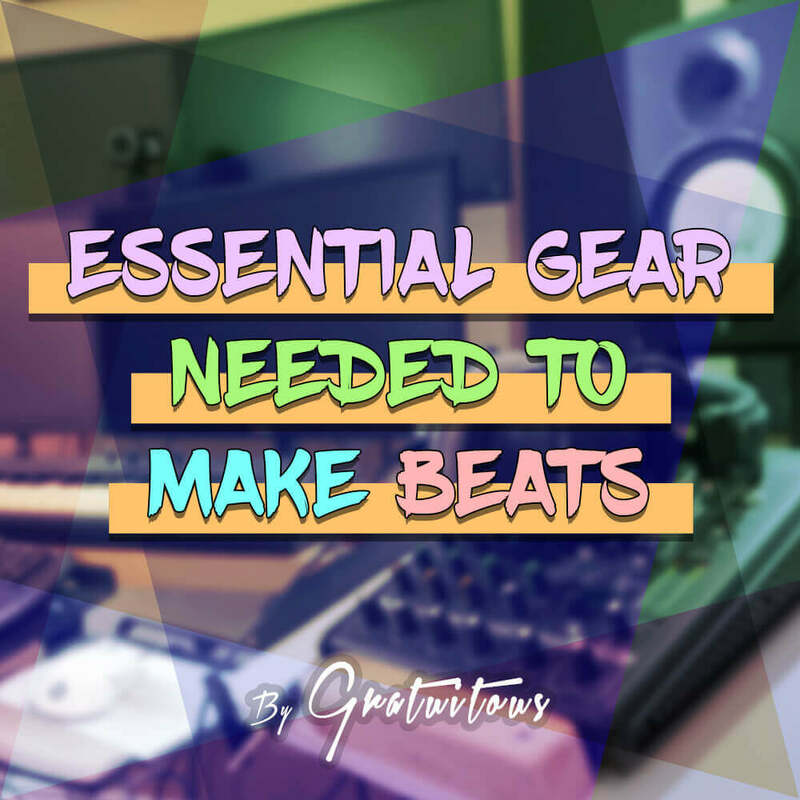 Many times they even bundle in headphones and a mic stand – you save a lot this way! Please let me know if you have a favorite microphone. I would love to try it and then add it to this list. Hi again, or if it’s easier I’m willing to pay you to make a tutorial of you recording your vocal over one of your tracks from start to finish, showing me how I get it clear, eqing it compressing it, again I don’t mind paying you for a tutorial, cheers again Craig. I released this article on getting thicker vocals.. it may be of use to you? The bring life to your vocal, maybe you could add a bit of brightness on the EQ, but it also sounds like you may need to be adding things like reverb and delay to get it to ‘fit in the mix’ ?